Delightful chocolate flavoured buds are gifted from Choc-Matic in approx 75 days from germination. 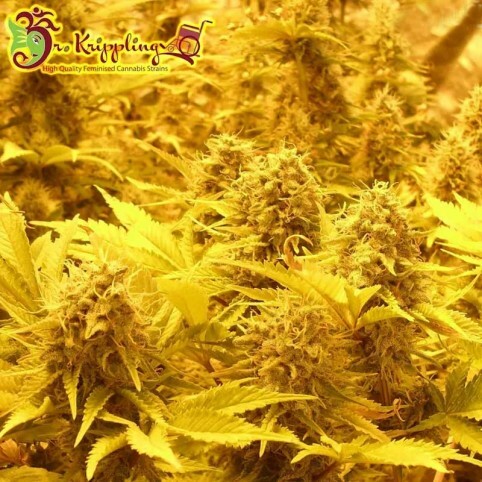 As with all our auto flowering strains, she is happy to rapidly grow indoors or outdoors, but it is advised to avoid too much stress as every day is a full time working day for these wonderful auto flowering strains. “Bred to be a heavy weight performer, this plant does not disappoint. Ideally needs to be switched t..
Krippling’s mix of blueberries, with a touch of ruderalis, produces an auto flowering crop which clo..
One beautiful mix of Indian and Nepalese Genetics, which are mainly indica heritage. These plants se.. I'm so dizzy; my head is spinning!!!!! Check out and discover something new with this Krippling Nort..
Get multiple Spinning Buzz Kicks to your head, back and legs, when experiencing this Krippling auto ..
2 x Dizzy Lights, 2 x Spinning Buzz Kicks & 1 x Sonic Boom (Double for 10s)..
Due to the instantaneous demand and proven success of our Incredible Bulk, everyone at Team Kripplin..